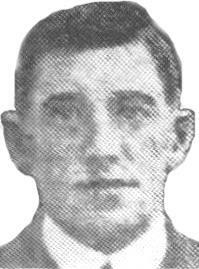 Home Titanic Survivors George Francis 'Paddy' McGough McGough the Key? 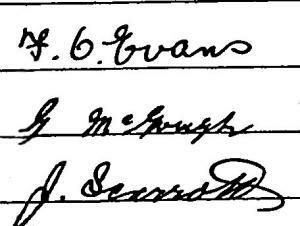 THERE’S a Titanic seaman named McGough who is claimed to be a human key to understanding the sequence of lifeboat departures. He’s said to have helped lower lifeboat No. 14 – but to have departed in lifeboat No. 9 on the opposite side of the ship. This is said to establish that boat 9 left after boat 14 – and that the aft starboard boats thus went relatively late in the night. There are a number of problems with this whole contention, however, which this article will attempt to tease out. The AB in question was George McGough. 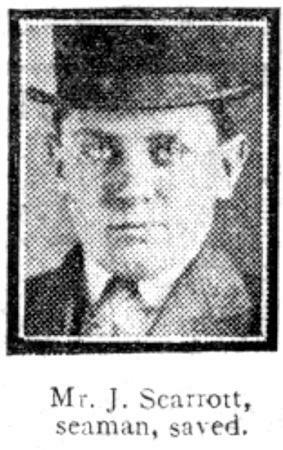 The idea of a “James” McGough as a Titanic AB appears based on an error in the crew list compiled by the American Inquiry (which may have confused sailor McGough with a passenger of the same surname, James R. McGough, a buyer for a department store). But the American list cites only ‘J. McGough,’ whereas the actual Titanic sign-on list, and the subsequent sign-off list for receipt of wages, both make it clear that he was George McGough, originally from Duncannon in Co. Wexford, Ireland. The Titanic Commutator (Vol. 25, No. 55) perpetuated the error in 2001, in what it called a fresh look at the lifeboat launching sequence. The non-existent “James McGough, AB” features prominently in a subheading (p. 158) as one of the hinges of the whole affair. ”From Scarrott’s testimony, McGough manned the aft davits during the lowering of [lifeboat] 14.” That bit is true. Scarrott named the crewman who was helping to lower his boat (No. 14) as it headed down into the water. But, in point of fact, we can’t derive such a certainty from the scant evidence about McGough. We don’t know about his presence in No. 9. It is a surmise, and one that might very well be wrong. 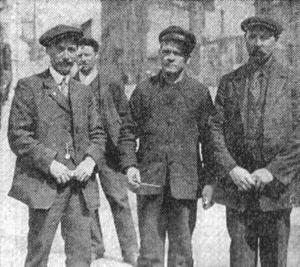 Point 1 – Bosun’s mate Albert Haines does not say – emphatically, does not say – that McGough left the Titanic in boat number 9. Neither does anybody else in evidence. Haines: I went and stood by my own boat, sir, No. 9… We had the boat crew there… and we filled the boat… and lowered the boat. Senator Smith: Mr Murdoch told you to get into this boat? Mr Haines: Yes, sir. I was in charge of that boat. That was my own boat, there being two sailors with me. Smith: What were their names? Haines: One was named McGow, and there was one by the name of Peters. That was my boat's crew. Smith: That is, your regular boat's crew? Haines: Yes, sir; just the two men. Smith: Was there a station bill posted at that time on the Titanic? Haines: Yes, sir; a boat-station bill, before ever the ship left. Haines said the crew allotted to the lifeboat by the muster list were present at No. 9, “with me” as they awaited orders. His evidence is as much capable of the interpretation that the sailor element of the crew – Peters and ‘McGow’ – lowered the boat, rather than departed in it. Or that one of them may have done so. Senator Smith: How many men were there in the boat? Haines: We had over 50 in our boat all together. Q. Men? – The two sailors; and then I could not exactly say how many men, but there were three or four stewards, and three or four firemen. Do you remember their names? – I think the stewards are here with us now, sir. Just give their names, please? – I do not know their names. Secondly, “the two sailors” is capable of referring only to the boat’s two sailors, not to “the two sailors I have already named,” because each lifeboat was allocated a complement of two ABs, or able seamen. Indeed, Haines says it himself, that his allocated boat crew consisted of “just the two (sea)men.” The lifeboat departed with two seamen, but they may not have been both the sailors originally stationed there. Later Haines says; “I called the sailors aft,” and passed a remark to them, consulting whether to go back to the aid of people in the water. These are the sailors who were eventually instructed to enter the boat, whoever they were. Of course Haines’ evidence is capable of meaning that “McGow” and some other sailor were the ones he called upon while afloat, but again it is not specific. Just to complicate matters, Wynn says there were up to four ‘seamen’ in the boat. Yet the doubt exists. Just as there is a doubt, perhaps, that ‘McGow’ necessarily means McGough. 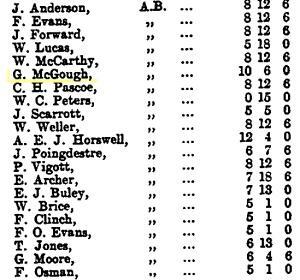 McGough shown as 'McGoff' in a WSL survivors list, Southampton 1912. Point 2 – An Englishman like Haines would pronounce the name McGough as “McGoff,” and not as “McGow,” which is what appears in the US Inquiry record. There are clearly regional and continental differences in pronunciation. But it is not our own preferred pronunciation that is the issue at stake. The Southern Ireland pronunciation is ‘McGoff,’ and George McGough was from Wexford, halfway between Cork and Dublin, where the local pronunication is McGoff. The Titanic AB would have called himself ‘McGoff,’ and spoken this sound in telling shipmates his name. We cannot presume. It is like the word ‘bow’ on its own. Would this mean the prow of a ship, or something you take during a curtain-call - or alternatively ‘bow’ as in ‘bow and arrow’ or a girl’s pretty bow? The stenographer is trying to represent the name heard, or rather, misheard, because there was no ‘McGow’ on the ship’s articles in any capacity. Immediately beforehand, Haines had said there were 15 men in the boat. He cannot be responding now that there were 45-48 men. The stenographer, making a mistake, has put the word ‘men’ into Smith’s question, whereas the Senator actually asked: “How many women were there in the boat?” Haines’ answer proves the mistake of something misheard. What is certain is that neither the sounds ‘McGâo / ‘McGo’ come close to representing the name ‘McGoff’ if Haines was actually saying ‘McGough,’ as he should have done if he knew the sailor. The idea then has to be entertained that ‘McGow’ was not an attempt to say ‘McGough’ but some other name. Which? There are very few possibilities in the limited number of Titanic seamen. But there are some. One AB was named Pascoe, and survived - in what lifeboat is unknown. Another, drowned, was called Couch. Yes another was named Vigott – at first glance an unlikely candidate, although he also survived. But Vigott was born in the Channel Islands, where pronunciation is influenced by their extreme proximity to France. Titanic researcher Mandy Le Boutillier, who lives in Jersey, suggests that the name Vigott would not rhyme with ‘ticket’ or ‘bigot’ in local patois. Could “McGow and Peters” be a rendering of the pronunciation ‘Vee-Goh’ and Peters? Bizarrely, this reported seaman does not look like any of the surviving ABs whose pictures were taken in 1912, and certainly not like his only AB ‘soundalike,’ William Weller. There is a surviving CR10 picture of Vigott from 1921 held in the Southampton City Archives. Take a look at the experiment below, when this Vigott picture (extreme left) is compared to “Gillow” (middle), and then tilted with the ‘Gillow’ moustache added. The nose and chin in the Vigott picture match exactly with ‘Gillow.’ Weller appears at extreme right for comparison. Point 3 – Crewmen who stood by their boat stations were sometimes sent away by officers to other duties elsewhere. In fact, only a minority of people who cited their boat allocation from the lists posted up in all crew departments actually went away in those boats – even if they first attended at them. This is shown by an analysis of cited boat stations as against the means of their actual salvation. Haines himself testified that his immediate superior, Bosun Nicholls, missed his boat (No. 7) because it went without him. Many missed their boats in this way, and drowned, but others were saved in different boats to the ones to which they were initially directed by the list. For McGough to have been initially present at lifeboat 9, because he was one of its designated crew, does not necessarily mean that he went away in boat 9. He could have been sent away elsewhere from 9, work later at 14, and then be saved in another boat. AB Fred Clench was sent away from boat 11 in this manner: “We were sent there to uncover the boat, and an officer came along and drafted me on the other side, the port side,” he says. Another sailor, Joseph Scarrott, says he saw McGough lowering boat 14, don’t forget. This is because Clench [who was later saved in 12] was first working at No. 11, which left after No. 9… and then went to 16 and 14. Of course, if boat 9 goes without him, McGough can then work at 14, as Scarrott clearly testified. Boat 9, in these circumstances, does not have to wait to go until boat 14 is lowered, in order to itself accommodate McGough. That may be a misapprehension. 597. Am I correct in saying that McGough was in the boat? — No. 598. He assisted you? — Yes, he lowered that fall. 599. He did not go into the boat? — No. 607. Point me out where you were during this time, during the lowering of the boats? — This was the last boat I worked on, No. 13. That was the last one I worked on. My boat was on the other side of the ship. 608. You were on the port side? — Yes; I went to my own boat afterwards. Why would they wait to lower No. 9, the next in line to be lowered, when boat 14 has not yet even been readied? Does that make any sense at all? Steward F. Dent Ray was allocated to boat 9 (US evid.). It was his boat station. Like McGough, he was officially part of the boat’s crew by the muster list. Ray helped to load No. 9, but did not get in. Why do we then presume that McGough got in? Senator Smith: Whom did you find there at the boat? Ray: Sailors and about a dozen other men. Q. How many sailors? - About two sailors at each one [of] the winding arrangement to wind the boat up. [He means down]. This raises the possibility that McGough, even if part of boat 9’s crew, may have merely lowered the boat – and two sailors did – just as McGough would go on to lower No. 14. Quartermaster Walter Perkis is another example of what might have happened. He lowered No. 4 boat, the very boat to which he was assigned. Assignments, to some crew at least, meant to work at the boat, not to be saved in it. Perkis lowered his allotted boat and walked away along the deck – only later rejoining his lifeboat when it was short of hands, and when it called out for him to do so. Point 4 - Much other testimony supports the contention that lifeboat 9 departed before lifeboat 14. For the theory to be right, McGough has to lower boat 14 on the port side, before joining boat 9 on the starboard side, and then departing in her. Yet a surprising number of crew testify that the starboard boats were lowered before the port boats. This agrees with bedroom steward Alfred Crawford in boat 8: “The starboard boats were lowered before ours were.” (US evidence). “I went to my station at the boat, which was boat 1, on the starboard side. I saw that lowered before I myself got there; that is, I myself did not get into it, as there was no room. Point 5 – Witnesses say No. 9 went in rapid sequence (counting from the bow), which does not support the belief that No. 14 preceded No. 9, because No. 9 would have to wait. Beesley’s account is already cited above. Saloon steward William Ward said: "No. 9 went before No. 11." Senator Fletcher: Did you see any lowered after you left? Ward: “Yes, sir. No. 11… We [in No. 9] were already down in the water. Assistant second steward Joseph Wheat said he saw water coming down the staircase from E Deck to F Deck “about an hour” after the collision (Br. 10969). That’s circa 12.40am. He went from E deck up to B deck, where he met the chief steward and they exchanged words. Br. 11071. — Then I went along forward and up the forward stairway up on to the boat deck and there I saw they were just filling No. 9 boat, starboard. Senator Newlands: How many had been lowered before you took No. 11? Wheelton: I believe the emergency boat had gone; No. 3 had gone; No. 5 was going as I went to the storeroom; No. 7 had gone; No. 9 had gone, and No. 11 - that was my boat. Fifth Officer Lowe also arrived at boat 14, coming directly from the starboard side. Lowe’s five boats have most likely gone away on the starboard side! So which are the five boats (excluding No. 5) that went away without an officer before Officer Lowe arrived at No. 14? Lowe saw 5 and 3 and 1 depart, by his testimony. That’s only two officer-less boats. What are the numbers of the other three? If Lowe sees aft starboard boats in the water, they must surely include No. 9 by the testified sequencing. This is before he reaches No, 14, which is not even ready to load, let alone lower. The proponents of the “14-before-9 theory,” in their revised timings and departures, have only three officer-less boats leaving on the starboard side (7, 3, 1) before No. 14 goes. To satisfy Officer Lowe’s testimony, they would have to divert him to also watch boats 8 and 6 leave on the port side… but Lowe doesn’t mention either of these boats in evidence. So does the fault lie with Lowe’s testimony or with the McGough theory? Point 6 – Perhaps the biggest obstacle to the theory is McGough’s own interview account! McGough himself suggests he was on the Titanic until very late – not that he had departed in the relatively early lifeboat 9. Patrick [sic] McGough, an Irish seaman, according to the Daily Mail, said that no-one was killed by the collision. “When I left the Titanic,” he said, “she was down to below the forecastle. I saw her back break, and I heard an explosion, either of her main steam-pipe, or of the boilers. I last saw Mr Murdoch, the first officer, when he was lowering No. 15 boat and keeping back some Italians. I distinctly saw the lights of another ship. McGough is rendered as “Patrick” because he was nicknamed ‘Paddy’ because of his Irish origins. 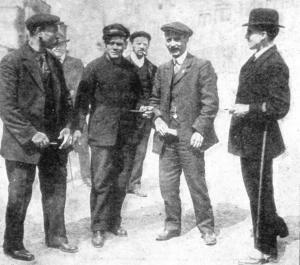 McGough was one of the first three crew to walk out of the docks at Plymouth the previous day, when eager waiting journalists pounced, and also took his picture. He is showed below, centre, in a picture from the Daily Sketch. The forecastle was eventually submerged by water, which happened some time after the forward well-deck (below the forecastle) was flooded. This would mean water up to B Deck. It could not be boat 9! Br 2141: Can you tell us a little more closely about it? Did you notice? 2542. — Yes, the foc’sle deck was not under the water when we left the ship. 2543. Was it pretty low down? — About half way down I should say. Boat 15 left after boat 9. McGough could not have seen what was taking place on deck if he had left in No. 9. The above strongly suggests that McGough was present at No. 15, and then went to No. 14. The above suggests McGough left in a late forward boat. Nobody in boat 9 claimed to have seen Captain Smith at the end. McGough says he saw him ‘at some distance,’ although it was very dark. Yet boat 9 had pulled off by “a couple of hundred yards,” according to William Ward’s account. It goes on to name them. It is not clear whether this is hearsay that AB McGough has picked up. The use of the phrase “were seen” is in the passive. McGough gave a deposition to Board of Trade examiners on landfall. It is currently lost, and its contents are unknown. Yet he was kept available to testify for a long time, according to the records of attendance expenses. What would be the point of retaining someone who departed in a relatively early and totally unremarkable boat? 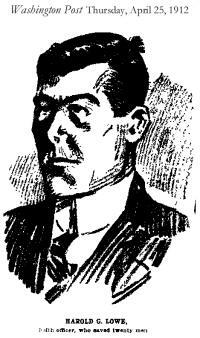 But surely if McGough had stayed on the Titanic long enough to see some end-time things (as he was reported in the newspapers to have done), then there would be motive to keep him on hand during the Inquiry. “G. McGough” received £10 and six shillings for attendance. That was more than Haines, the commander of boat 9, who actually testified, and received only £5 nine shillings and six. But there are anomalies in witness expenses and it may be wise not to place too much reliance on the final sums paid to individuals. At the same time, however, the retention suggests that there was something of interest in McGough’s deposition. Point 8 - McGough’s listing in the Ship’s Articles does not suggest that he was assigned to lifeboat number 9. It appears that lifeboat stations were allocated according to the Articles - in other words, according to the order in which crew members signed on. Col. Archibald Gracie, in his book, attributes Mrs May Futrelle to boat 9. This would put an “Irish sailor” in boat 9, if Gracie’s attribution were correct. But unfortunately Mrs Futrelle does not appear to have ever claimed to have been saved in boat 9, saying repeatedly in interviews that she was instead put into one of the last boats to leave. The basis for Gracie’s attribution is unclear. Any Irishman will be called “Paddy” and there were a number in the deck department who were Irish and who were saved, such as Robert Hopkins and William McCarthy. There is thus nothing to necessarily link Miss Watt’s Irishman with McGough, except a misapprehension that George Francis McGough was actually named Patrick. It would thus appear that Miss Watt, who was twelve years old at the time of the disaster, may have been "confirmed" in boat 9 because Colonel Gracie identified [‘Paddy’] McGough as being saved in boat 9. There seems to be no contemporaneous 1912 account putting the Watts in No. 9, although Bertha, in 1917, mentions a Minister in her boat, and Rev Stuart Collett was certainly in No. 9, later saving its lifeboat numeral as a souvenir. AB George Francis McGough may possibly have been saved in boat 9 – but the problems adduced above, not least his own reported account, should give us careful pause. He may very well have been saved in another, later, boat. We cannot know that McGough was in No. 9. Therefore it seems most unwise to use the alleged certainty of his presence as the hinge for an entire choreography of Titanic lifeboat departures. The appearance of his original 1912 deposition may yet resolve the issue. Go to: "McGough the Killer"
All illustrations supplied by the contributor, except where indicated.